We got to test a tick repelling product you put on your dog but have the luxury of being able to take it off. 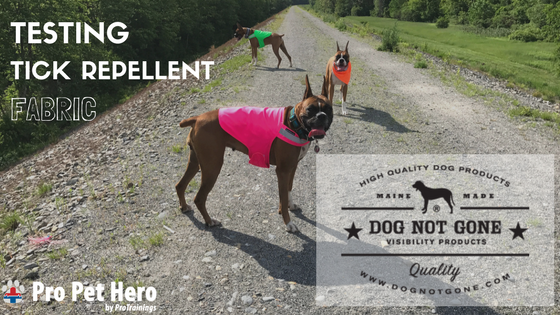 I was fortunate enough to be contacted by a Maine company called Dog Not Gone about some of the NO FLY ZONE™ products that not only repel mosquitos but they repel ticks. They wanted to send me some examples and try them out on my own pups. I looked them up and figured it was worth a shot so I sent my mailing address and waited for the products to arrive. I’m a skeptic, a HUGE skeptic. I am also big into avoiding cancer for myself and my pets so we stay as natural as we can in our house. We do not use monthly topical flea and tick preventatives and we do not use the pesticide pills. We use natural topical sprays that we make ourselves mostly out of geranium oil, which we have found to be the most affective product for preventing these parasites. Located in Massachusetts we run our pups 3-4 times per week in high grass, woods and basically tick heaven. When we head out for a jaunt of this sort in these tick infested lands we expect to receive about 1-3 ticks per dog – without the oil, 10’s of ticks. So when the owner of Dog Not Gone, makers of dog, horse and human visibility safety products reached out to me about their tick repelling products, I was intrigued. While I find the spray affective, it stinks. I have tried the numerous natural tick repellents on the market, sold many of them in my holistic pet supply store when I had that but none have proven as affective as using the stinky geranium oil. I’ve gotten used to it but I have received comments out in pubic asking, “what that smell was?” and yep – it was my dogs. We also got a headband but my husband was already sporting this by the time I took the picture. We tore open what was left, placed them on the dogs and literally headed out for some of the tallest grass we could find – we succeeded. Since I am a visual person, I made a video of our adventure. We didn’t use any spray, just the two vests and even the lower coverage kerchief. We found 2 ticks total, 1 on 2 of our dogs. That to me is a great success given the length of that grass and that we were in deer country. Other honorable mentions are about the fit. The kerchief slides over your pups collar so no fussing with knots or worrying about it coming lose. My dogs have deep chests and we often find things don’t fit them well given their chest proportions. The vests not only fit perfectly, they allowed for complete range of motion. We have had some vests and jackets cause chaffing from the fabric rubbing while they run. The vests also have a double velcro strap so they are not coming off without human intervention. I cannot tell you how many dogs I have let off the lead with a vest on only for them to return naked. I’m pleased with the products for many reasons. Not only did they fit well, repel the very pests they said they would but they also can function in the fall and winter as visibility vests during hunting season. The reflective tape and bright colors make them hard to miss. For those of you taking night strolls, these would be great. If you live in tick-land or mosquito-ville and would like to try an affective alternative to spraying or applying chemicals to your pups, I’d give these products a shot. The fabric is permeated with permethrin, a synthetic form of a naturally occurring repellent found in the chrysanthemum flower so that’s how they repel. It binds to the fabric and not to your pet. I find it better to put a fabric with the chemical in it on my pups rather than spraying them directly with some chemical that I can’t get off without washing. Chemicals can soak into the skin and be licked by our pets – they’re not always so safe, read the warnings on the packaging. So what’s the big deal about ticks? I wrote a blog post back in the fall when they were ticking me off. Ticks of varying species are wide-ranging throughout the US and carry several nasty diseases. Keep your pups and you (Dog Not Gone has human products too) safer this pesky parasite season by trying out an affective alternative to topical solutions. I haven’t tested them in regards to mosquitoes but the NO FLY ZONE™ material is expected to work against those little flying blood-sucking freaks as well. Want to try for yourself? Use the code propethero to save 15% off! !